IntegratedCare4People.org is a website built up and supported by its users. This means that every user can register and contribute to all parts of the platform. 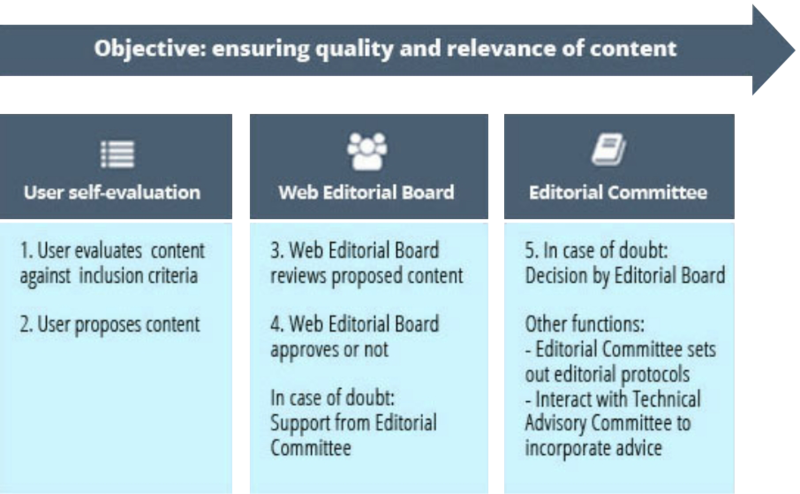 In order to guarantee that all the information it contains and receives is relevant and of high quality, this editorial policy will be applied to help us assess all the content submitted and proposed for upload. Aligned with the Framework on integrated people-centred health services - Aligned with the vision, principles and goals set out in the Framework on integrated people-centred health services. Supporting Universal Health Coverage - Supporting moves towards Universal Health Coverage, defined as ensuring that all people have access to the promotive, preventive, curative and rehabilitative health services that they need, that these are of sufficient quality to be effective, while also ensuring that use of these services does not expose the user to financial hardship. Led by whole-systems thinking - That views the health system as a whole and tries to understand how its component parts interact with each other and how the system might be influenced by factors beyond it. Ethical - By making sure that care optimizes the risk–benefit ratio in all interventions, respects the individual’s right to make autonomous and informed decisions, safeguards privacy, protects the most vulnerable and ensures the fair distribution of resources. Participatory - The notion of people-centred and integrated health services puts informed and empowered people at the centre of the health system. Therefore, processes to develop national strategies for such services should ensure accountability to local stakeholders and, especially, to disadvantaged populations. IntegratedCare4People.org offers through syndicated content updates of all our sections automatically and for your convenience in your RSS reader. Please, feel free to subscribe here.